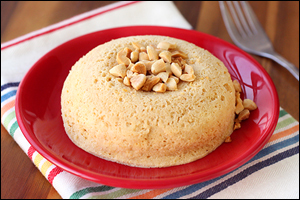 This cake is made with powdered peanut butter, coconut flour, and protein powder. Which means? A dessert that's low in fat and high in protein! Spray a microwave-safe mug with nonstick spray. Add flour, protein powder, powdered peanut butter, baking powder, and sweetener. Mix well. Add egg whites, soymilk/almond milk, vanilla extract, and 2 tablespoons water. Stir until uniform. Microwave for 1 minute and 15 seconds, or until set. Sprinkle with peanuts. Eat warm. 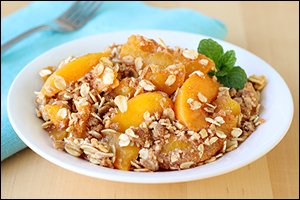 In a medium bowl, toss peaches with both extracts. Add cornstarch, 2 tbsp. brown sugar, and 1/4 tsp. cinnamon. Mix until evenly coated. In another medium bowl, combine oats, flour, remaining 1 tbsp. brown sugar, remaining 1/2 tsp. cinnamon, and salt. Add butter, and stir until well mixed and crumbly. Transfer peach mixture to the baking pan. Evenly top with oat mixture. Bake until topping has lightly browned and peach mixture is bubbling, about 25 minutes. What? Like your pals don't want dessert recipes? That's what we thought -- click "Send to a Friend" now.